It's Daffodil Day in Australia on Friday 22 August. Please donate generously to fund cancer research and to help cancer sufferers. The columbine is a very pretty flower. Lovely! Thank you for hosting. Happy FFF! Wonder if my comment got through - the colombine has one of the most delicate shapes. Have seen them in white and purple around in California, but not yet in red! Thank you so much for the info. I especially like knowing the eagle and dove roots of the names. Nice, and great photo, as usual. You've done a great shot! Colombines are wonderful flowers, amazing shot! Beautiful composition, I have not joined in this meme for a long long time, lovely to be back today! Pretty picture! I bought one plant on the sale rack when it was done blooming, so I can't wait for spring to see it's flowers! I also bought some seeds. Hopefully I get to share this type of flowers next year. 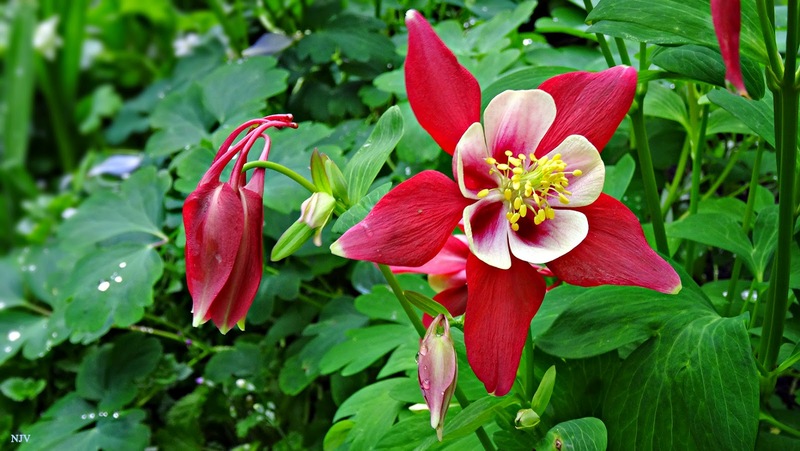 Columbine does exceptionally well in my garden. What I like best about them is that they send me a few "gifts" every year at random places. Every year, I look for the new comers. It's fun. You are right about them preferring a little shade. The ones in partial shade are so much taller. I like the colors of your Columbine. I should locate one next spring. Re question of Linnea flower. Yes. probably named after Linneaus.